Knowing how to calculate your income is an important skill. It will enable you to make a personal budget, make a good debt repayment plan and give you an excellent snapshot of your overall financial health. It's also important to have this information in case you need to report your income to outside institutions like your insurance company, the IRS or creditors. Write down your hourly salary. Multiply this by how many hours you work each week. Next, multiply the result by four. This is your monthly income. Write down any other sources of income you have such as disability, rent from a property you own or other regular payments. Add each of these income amounts to your monthly income. You now have your "gross" monthly income (the income before taxes or anything has been taken out). Write down your monthly salary if you are trying to calculate your hourly wage. Divide this number by four. Then divide the result by how many hours you work each week. The result is your hourly wage. Figure out your gross monthly salary. Write down all of your deductions and expense. This includes taxes (federal, state, Social Security and Medicare), health care coverage, payments into a retirement fund, rent or mortgage, groceries and car payments. See "Tips" for how to calculate your income taxes. Write down how much each deduction or expense costs every month. Add these costs together, and subtract the total from your gross monthly income. Whatever is left is your net income. If this number is negative, then you know you're spending more money than you're making every month. Figure out your gross monthly income. Follow the instructions for the IRS Form 1040 (see Resources). You must first figure out if any of your income is exempt from being taxed. Each dependent you have who relies on you for income is considered an exemption. You can also claim yourself as an exemption if you are being claimed as a dependent on someone else's taxes. Certain interest can be claimed as tax-exempt as well. 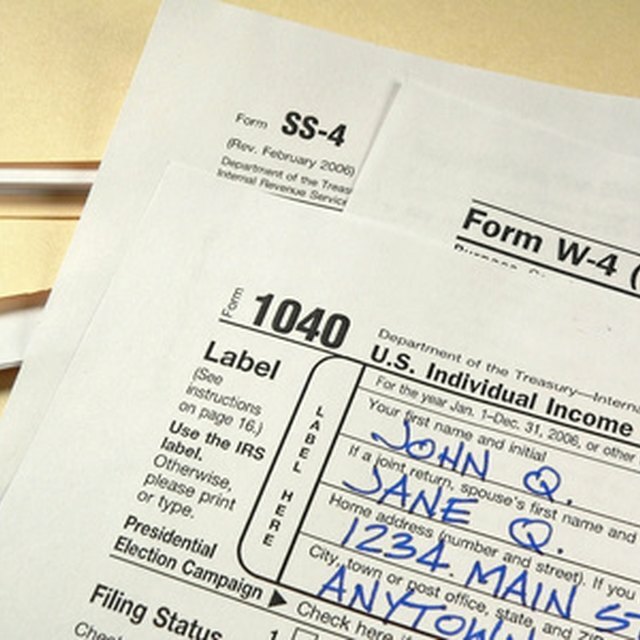 Follow the instructions for the IRS Form 1040 to find out what deductions you can claim. Things like educator's expenses, tuition and moving expenses will be subtracted from your gross income to determine your Adjusted Gross Income, which is your taxable income. Calculate your "front-end" debt-to-income (DTI) ratio, which is just your housing payment against your gross monthly income. For example, if you earn $4,000 a month ($48,000 a year), and your mortgage payment is $1,000, then your front-end DTI ratio is 25 percent. Calculate your "back-end" DTI ratio, which is your total monthly expenses against your gross monthly income. For example, if you earn $4,000 a month ($48,000 a year), and your mortgage payment is $1,000 plus you spend $2,000 on gas, groceries, and bills, then your back-end DTI ratio is 75 percent. To figure out the taxes on your monthly income, you need to figure out the following: 1. Federal taxes: find your tax bracket (see Resources). This is based on your tax filing status and your gross yearly income. 2. State taxes: find out what you owe your state (see Resources). 3. FICA (Federal Insurance Contributions Act): Social Security and Medicare will run you 7.65 percent of your paycheck if you're employed by someone, or 15.3 percent if you're self-employed. To find out how much all this is, take your total gross monthly income. Multiply it three times: once by the Federal percentage, once by the state percentage and once by the FICA percentage of either 0.765 or 0.153. Add the three answers up, and you'll know how much to subtract from your monthly income for taxes. 1. Federal taxes: find your tax bracket (see Resources). This is based on your tax filing status and your gross yearly income. 2. State taxes: find out what you owe your state (see Resources). 3. FICA (Federal Insurance Contributions Act): Social Security and Medicare will run you 7.65 percent of your paycheck if you're employed by someone, or 15.3 percent if you're self-employed. To find out how much all this is, take your total gross monthly income. Multiply it three times: once by the Federal percentage, once by the state percentage and once by the FICA percentage of either 0.765 or 0.153. Add the three answers up, and you'll know how much to subtract from your monthly income for taxes. CNN Money.com: What's FICA again?